Kunti,the mother of the Pandavas, was always worried about the welfare of her sons. She was afraid that the Kauravs would kill them. She prayed to Krishna to help her sons. 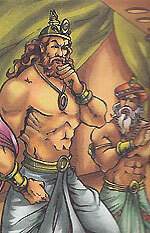 Krishna sent his messenger, Akrura, to judge the situation in Hastinapur King Dhritarashtra. He realised that King Dhritarashtra was partial towards his sons, the Kauravas, and wanted them to take over the throne. He also realised that Dhritarashtra always supported his sons in their attempts to kill the Pandavas.Akrura indirectly advised Dhritarashtra to keep away from his evil plans and to give the Pandavas the throne, as it was rightfully theirs. But Dhritarashtra refused to change himself. Akrura returned to Krishna and Balarama in Gokul. He told them about the situation in Hastinapur.